The mere existence of "When We Rise" is almost virtue enough. But in terms of tone and execution, the four-part event series from ABC is wildly uneven, crossing from moving stories of romance under oppression to retellings of history that are so broadly pitched -- and with such bad wigs! -- that they're too after-school special to be truly affecting. Still, the fact that an eight-hour educational reconstruction of the gay rights movement is taking up primetime real estate on a broadcast network is evidence of a revolution -- a still-unfolding one, to be sure, but one that has transformed the social fabric of this nation. In just 50 years, America has gone from a land where homosexuality was an illness treated by psychologists with lobotomies and electroshock treatment to one where gay marriage is the law of the land. "When We Rise" is an attempt to explain how that happened, from 1972 to 2013. 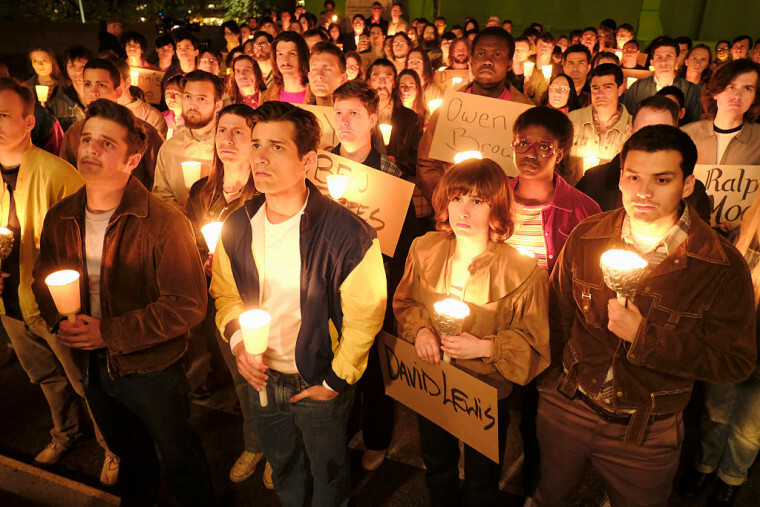 Eight hours is not much time to cover so much ground, but then again, the series seems to be designed as a relatively superficial overview of the gay rights movement, focusing less on what happened and more on how it continues to be relevant. Despite the presence of talented performers like Michael Kenneth Williams, Guy Pearce, and Mary-Louise Parker, "When We Rise" shines when it focuses on youth -- the activists who were young in the '70s, the young men dying of AIDS in the '80s, the confused kids who grew up with two moms in the '90s, and the young queer millennials who came of age in a world where much more was possible than just a few years before. The organizing spine of "When We Rise" are the interweaving stories of three activists in San Francisco, who variously devoted their lives to (and were ravaged by) the cause. One is Roma Guy (Emily Skeggs in her youth, and Parker as an adult), a feminist activist who discovers her own sexuality in the process of agitating for the rights of her friends who are lesbians. (Skeggs, who was nominated for a Tony for her role as Medium Alison in "Fun Home," brings a nervous, idealistic energy to the role that is just as captivating onscreen as it was in the musical; the character's transition to Parker, a very dissimilar actress in terms of appearance and energy, is extremely jarring.) Roma ends up making a fragile alliance with Cleve Jones (youth, Austin P. McKenzie; adult, Pearce), a gay teenager barely surviving on the streets of San Francisco. Jones would go on to become one of the gay rights' movement's biggest figures -- and indeed, he is a familiar character for "When We Rise" writer Dustin Lance Black and director Gus Van Sant, who told the story of Harvey Milk through his eyes in their film "Milk" (Jones was played by Emile Hirsch in the film). In their first joint effort, Roma's feminist protestors, rallying against an unlawful arrest, are joined by Cleve's gay male friends, creating a group much bigger than the organizers believed possible. It's a beautiful moment -- brought quickly to an end by the police, who teargas the protestors. The third protagonist is Ken Jones (Jonathan Majors and Williams), a black Vietnam navy veteran who is both the most tragic figure in the story and the most alienated -- from the movement and from the other "characters." His race cuts him off from the mainstream gay movement brewing in the Castro neighborhood of San Francisco; his sexuality cuts him off from other veterans and the black community. Despite all of this, he manages to be an extraordinary and compassionate man, struggling through hardships that are so numerous they become difficult to process. His arc is the least satisfying, and it may be that Williams, Black, and Van Sant produce that on purpose; Ken is evidence of the kinds of bodies left behind or overlooked as the gay rights movement went mainstream. The first few hours of "When We Rise" -- before the shift to "adult" actors -- are the most resonant. With so much time at its disposal, the series can use long scenes to depict just how hostile San Francisco's institutions were to the gay community before grassroots protests, organized volunteers, and a coalition of movements could come together to assert their identity (what Cleve calls "all the us-es"). But just as they begin to bask in the glow of marginal acceptance, men start to get sick -- slowly, and then all at once. Cleve and Roma, who had transitioned to political activism, find themselves back to fighting for their lives; in a sad but beautiful karmic loop, the men who showed up for women's rights end up dying in AIDS wards nursed by the women they fought for. Ken, who had won a hard-earned enclave of peace, ends up bereaved, homeless, and an addict. In the '90s, this makes way for a digression about President Clinton's strained relationship with the gay community. But as important as these stories are, they are not well-suited to this rushed history; the AIDS plague alone has inspired some of the finest works of fiction of our era. Instead what "When We Rise" is best at demonstrating -- and most pointedly demonstrating, for a movement that has picked up its protest signs again -- is how the day-to-day grind of change really works, for the people on the front lines. In the midst of seemingly endless prejudice and the predictable human struggles to find love, create families, and pay rent are the demands of revolution: coalitions, alliances, staying on-message -- and protesting, seemingly every other day. Cleve cherishes the bullhorn given to him by Harvey Milk; Roma pitches riotous arguments in meetings with feminists and lesbians and gay leaders about what to prioritize; and after Ken opens up a drop-in soup kitchen for gay teens, he ends up owing his life to a trans runaway whom he mentors. In the young activists' shared desperation are the seedlings of a nationwide movement. "When We Rise" notes the many fronts on which such a movement has to fight -- the internal conflict of coming out, the external struggle against blatant oppression and bigotry, and most unromantically, the inter-movement struggles. It takes Ken -- a man who gave years of his life, voluntarily, to military service in Vietnam -- decades to find a home in the gay movement, and it's only through a church led by a black pastor that chooses to radically open its arms to any and all expressions of sexuality and identity. And in another nod to contemporary politics, "When We Rise" champions intersectionality (and tries very hard to embody it, in its storytelling). Indeed, it is an unsatisfying story precisely because of the many loose ends and unfinished fights; but the arc of its history is a case study in how movements towards justice that cut out or silence a marginalized minority are doomed to fail -- whether that is the National Organization for Women's sidelining of lesbians, the Castro's lack of a home for black gay men, the inability of ACT UP and the Names Project to get along, and the underreported contributions of trans people of color to the ongoing movement. The final title card of the series reads, "... today, violence against LGBT people as well as racial, religious, and ethnic minorities is on the rise across the United States. One struggle. One fight." "When We Rise" is not exactly brilliantly rendered, despite its prestigious pedigree. But it is a bottled teachable moment for queer history -- re-enacting both the bigotry and violence of this era as well as its momentary successes. The natural end for this series is a long life of being shown in classrooms when a substitute teacher can't find a lesson plan. It will probably provoke the same snickers that any historical document produces in a classroom of kids -- That hair! The terrible CGI that splices the lead actors into historical footage! -- but what matters is that it is a historical document of this struggle. "When We Rise" makes the gay rights movement into something that is such a part of our history that school kids can get bored by it; a backhanded victory, but a real one, too. "When We Rise" premieres Monday, Feb. 27, at 9 p.m. on ABC.